Mova Nanova website has reached 100,000 views per month. First success of Belarusian crowdfunding at Talaka.by – animated Peppa Pig collects 164% of the needed amount. Stakeholders continue discussion on establishment of the National University for Belarus. First Mahiliou city picnic gathers more than 1,000 people. Minsk authorities for the first time allow the Protestants to gather for a mass prayer. Regional volunteers collect and deliver aid assistance for the wounded in the conflict zone in Ukraine. Mova Nanova website reaches 100,000 views per month. The traffic of an updated website of Mova Nanova, free Belarusian language courses, has reached 100,000 views in a month. The most popular section is Mediateka, where one can find several thousands of Belarusian videos, audio materials and books. 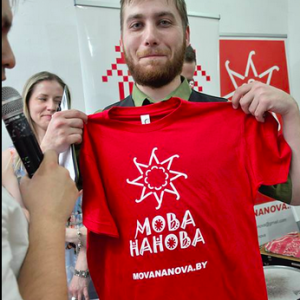 Mova Nanova/ Language Anew was founded in early 2014 and work in 10 Belarusian cities; weekly the courses are attended by 650 people. First success of Belarusian crowdfunding at Talaka.by. On 1 June the first successful crowdfunding campaign at Talakosht crowdfunding platform has finished. Project Peppa Peg that aimed at making a Belarusian language audio version of a known cartoon, has collected 61,85 million rubles (about $4,300); that is 164% of the sum needed. For two months of the campaign, the project was financially supported by 135 people. First Mahiliou city picnic collects more than 1,000 people. Dranik Fest is next! On 30 May the first ever city picnic was held in Mahiliou. The organisers – City Initiatives Centre – tried to make it as different as possible: people could play Frisbee, twister, chess laser tag. The aim of the picnic was to inspire Mahiliou residents on collaborative actions. Now the City Initiatives Centre has an ambition to hold the second Dranik Fest that last year got a very positive feedback. Regional Social Weekends identify winners. On May 22, Vitsebsk hosted finals of a regional Social Weekend, which brought together social ideas and business to support them. The competition presented eight projects of various topics; Grand Prix went to the Paralympic Fencing project. On May 30, the finals for regional projects is to be held in Brest. The Social Weekend is organised by MaeSens charity platform together with the Office for European Expertise and Communications (OEEC). Humanitarian route Initiative Belarus-ATO helps Ukrainians in need. Homel volunteers collect and deliver aid assistance for the wounded in the conflict zone in Ukraine and Ukrainian refugees. The money collected were enough to purchase a car for the medical service. The key principle of the initiative is not to arm any of the parties, but to help people who are left without protection – the wounded, the bereaved families, refugees. Competition of public art objects at Brest. Agency of regional development Dzedzich opens a competition for creation of city installations and small architectural forms in Brest. The aim of the competition is forming of progressive cultural field in Brest and development steps in new forms of actual art. Everyone is welcome take part and make Brest more attractive. Minsk authorities for the first time allowed the Protestants to gather for a collective prayer. The day before Saint Easter evangelic Christians gathered to pray in the walls of Chyzouka Arena Ice place. As organisers explained, the place was supposed by Minsk city council. The collective pray was attended by about 800 people and the Christians are perceived that first ever approved mass-pray (after several rejections) is caused by their community social work. Political prisoner Yury Rubtsou sentenced to two years in penal colony. On May 28, the Pružany District Court has sentenced a political prisoner Yury Rubtsou to two years of imprisonment in a minimum security penal colony on charges of evasion of serving his initial sentence. In the autumn of 2014, the Gomel activist Yury Rubtsou was sentenced to 1.5 years of special settlement on charges of insulting the judge. During the Charnobylski Shlyakh rally, Rubtsou was wearing a T-shirt with the inscription "Lukashenka, go away." Easier terms for setting up trade unions in Belarus. The procedure of setting up trade unions has been simplified in Belarus in accordance with ordinance No.4 signed by Alexander Lukashenka on 2 June. The related amendments will create more favorable conditions for the operation of trade unions, enforcement and protection of social and labor rights and interests of employees. In 2015 Belarusian journalists fined for more than $5,000. Belarusian Association of Journalists (BAJ) tracks a chart of fines to journalists for violating article 22.9 of the Administrative Code (unlawful production and distribution of mass media products). In 2015, the whole amount of fines is 85 million rubles, or about $5,600. Delegation of European Parliament announces a 2-day visit to Belarus in June. Delegation of European Parliament headed by the chief of delegation on Belarus Bogdan Zdrojewski will have a two-day visit to Minsk on 18-19 June. The delegation plans to meet families of political prisoners, opposition and civil leaders and Belarus officials. Top 30 websites in Belarus in April. Marketing.by presents the top 30 resources that have the largest coverage in Belarus in April 2015. Now Bynet has 5 million followers. In April, the Belarusian portal TUT.BYbeat youtube.com service and takes 5th place in the ranking. As before, the top 30 primarily consists of search services (Google.com – 1st place), social networks (Vkontakte – 2nd place), shopping sites, and entertainment services.